Again from Teri, she recommended to dream big, start small and learn fast. Create long term objectives and give yourself a vision to work towards – be optimistic, but also be realistic about what you can achieve and in what time frame. In addition to your long term vision, set short term goals to give you focus and get you started. Learn what’s working and what’s not working quickly and use this to accelerate your program growth to hit your long term goals. Petya, Global Influencer Marketing Manager at NetApp drove this point home in the context of building a business case internally, too: “start small, get the results and then present that as a business case. If you get results, nobody will tell you no”. Tim Williams, CEO at Onalytica highlighted that simply writing down your strategy will significantly increase your chances of success. Writing it down makes you more accountable, focused and gives you something to reference regularly when measuring program success. This is something that is so simple, yet neglected by most. So make this something you do before entering 2019! We were very lucky to be joined by Sarah Goodall, employee advocacy expert and Founder of Tribal Impact, who presented our co-authored Employee Advocacy 2.0 Guide. When we talk about influencer marketing, we immediately think of influencers with big audiences that are external to our brand, when in reality, we are all influencers. Brands have a whole network of influencers right at their fingertips: their employees. Your employees know your brand inside and out and have networks that trust and value their opinion. Shift your focus on helping your employees become influencers and subject matter experts by giving them quality content to share with their audiences, and training them and giving them the tools to create their own content. 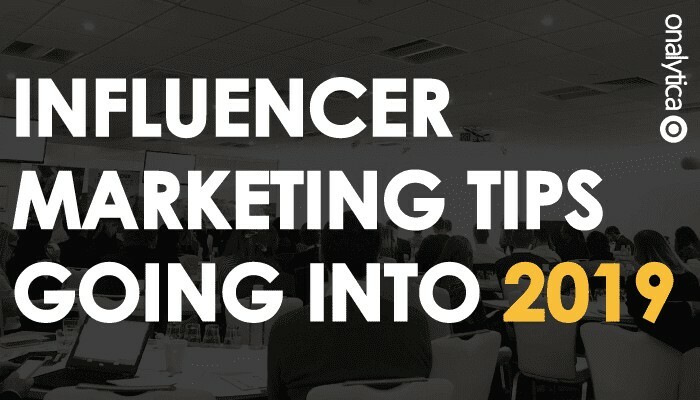 Owain Williams, Founder of Make it Manna highlighted that influencer marketing is often looked at as a totally new and different marketing division. While it is important to have individuals and teams leading on influencer marketing, it is most successful when integrated across all other areas of marketing. Why re-invent the wheel when you can integrate influencers into existing stuff that’s already going on across the business? For example, communicate and work with your content marketing team to co-create content with influencers, your events marketing team to invite relevant influencers to events and your product team on new product releases. Olly Lynch, Director of Digital Marketing at Travelport, expressed that he wouldn’t invest in any other type of marketing without a breakdown of the numbers & what can be achieved and influencer marketing should be no different. However, when asking the influencer panel if they had ever been set KPIs or objectives by brands, they said they hadn’t, but, they strongly believe that they can indeed help brands achieve business outcomes and so would be willing to have open discussions about this. While influencer marketing is all about building relationships, brands shouldn’t be afraid to have open and transparent conversations with influencers about their business outcomes. Influencers that can actualyl help you drive these outcomes will be open to discussing and bringing ideas to the table as to how they can help you achieve this. After all, being an influencer is a business – they get it! 7. Do you want top of funnel awareness, or to drive outcomes? Influencer Marketing and Influencer Advertising tend to be interchanged as terms, despite them being inherently different. Influencer Marketing is all about organically building partnerships with influencers that are aligned with your brand to gain your target audience’s trust, while influencer advertising tends to revolve around paying influencers to bring awareness to your products through their audiences. Both influencer marketing and influencer advertising are effective and have a place in their own right. If you’re looking to drive top of funnel awareness then influencer advertising can be a great way to get quick wins. If you’re looking to drive consideration and action then organically working with subject matter experts to win your audience’s trust is more appropriate. Alistair Wheate, Head of Product and Dominik Nosalik, Director of Client Services presented Onalytica’s recent research study into the alignment between influencer and brand partnerships, where we surveyed 267 influencers and 233 brand marketers. 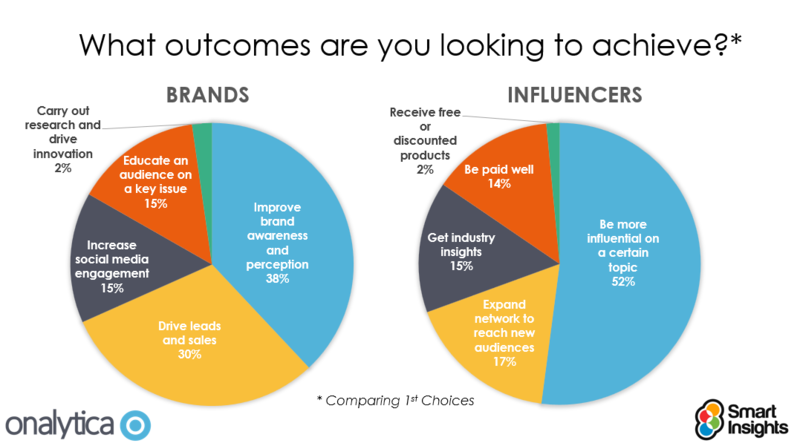 What was really interesting, was that 15% of influencers surveyed stated that their main outcome when working with brands is to gain industry insights, while only 2% of brands stated that their main outcome from working with influencers is to carry out research and drive innovation. This highlights a huge untapped for both brands and influencers to collaborate on industry research. 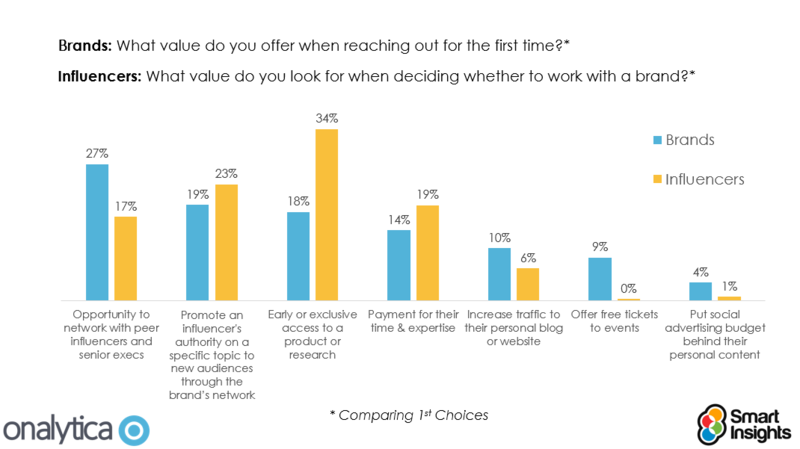 Reiterating this point further, 34% of influencers stated that early or exclusive access to research and products was attractive to them when working with a brand, while only 18% of brands offer this to their influencers. On the flip side of marketers undervaluing early or exclusive access to products and research, they’re overvaluing free tickets to events. What this ultimately says, is that influencers feel that they have more value to give brands, than they can gain from attending these events. Now this doesn’t mean that brands should stop giving influencers free tickets to events, but brands must rethink their complete offer around events to provide maximum value to influencers. Influencer budgets can in many cases be difficult to work with so free tickets to events are an attractive offer for brands, but instead of just offering free tickets, explore if you’re able to offer VIP access and tours, introduce them to another influencers of interest, or include them in a panel/give them a speaking slot – use the event as a facilitator to help them achieve the outcomes that are important to them. If attending the event will help them gain industry insights, expand their network or help them be more influential in a certain topic, they’ll go for it. 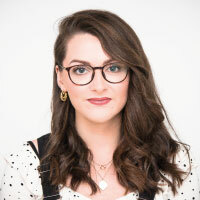 Marie Faulkner, Senior Social Media Manager from Marie Curie emphasised that the biggest learning curve for their team has been learning that the time and effort needed to build genuine relationships and partnerships with influencers is time consuming, but the value that can be gained from doing so is unparalleled. As Theodore Roosevelt so famously put it: “nothing in the world is worth having or worth doing unless it means effort, pain and difficulty”. Throughout Sarah Goodall’s presentation, she really focused on in the concept that we’re in an economy of trust. What this ultimately means, is that as marketers, we’re constantly competing to earn our target audience’s trust. Consumers are trusting brands less and people more, and so in order for us to gain their trust we need to leverage people more – be it our internal influencers (employees) and external influencers. The key takeaway message from our influencer panel was that it is important for them to stay true to their personal brand values and beliefs when choosing which brands to work with. Jane Frankland, Managing Director of Cyber Security Capital said: “I only align with brands who believe the same thing as me…I want to understand the mission statement before I want to work with that brand”. There’s a common misconception that influencer marketing isn’t suitable if you’re intending to reach C-Level professionals, as they’re not often on social media. While the latter part of this is often true, the C-Suite have internal influencers within their organisation that heavily impact their decisions. These mid-level managers are on social media and reading and engaging with influencer content that is floating around their network, and then sharing this through ‘dark social’ (Whatsapp, email, direct messenger and face-to-face) with the C-Suite. When it comes to integrating content marketing with influencer marketing, it is usually approached in a way that involves influencers in the latter stages to amplify content, by collaborating on content or getting influencers to share the content. Brands should look to the influencers much earlier than this, by listening to the influencer community and paying attention to what they’re talking about and the kind of content they’re sharing, to feed into their content strategy and content creation. Collaborating on content and amplifying your content through influencers will be much easier to do if you’re creating content that interests and is aligned with the influencers in the first place. Now when Scott Guthrie, Strategic Advisor at CampaignDeus first started talking about influencer fraud being a good thing, there were lots of shocked faces across the room. But the more he elaborated, the more those shocked faces turned into nodding heads: “Influencer marketing should get back to its roots, focusing on advocacy and authenticity. Fraud issues are forcing marketers to focus away from vanity metrics, which is a good thing”. Our Employee Advocacy 2.0 Guide and our research study into brand and influencer partnerships were big focus points for this event, so if you wish to get your hands on either or both, get in touch by clicking the button below. To view pictures of the day, click here. Onalytica’s Employee Advocacy 2.0 guide and research study into influencer and brand partnerships were huge talking points throughout our event. If you would like to receive a copies, get in touch here.